Of course you realize I am being facetious, as I consider shopping to be on par with dental surgery and drug-free childbirth, something to be tolerated only as a last resort and only when there are no other options available. 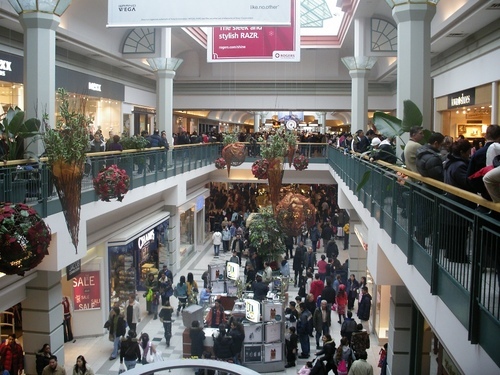 According to today's newpapers, Chinook Centre averages 80,000 people going through the mall on Boxing Day. I can barely stand to read a number like that, let along be one of that number being elbowed and jostled and shuffling along like cattle to wait in line, if you are fortunate enough to get a parking space, that is. I am barely leaving my favourite chair today. Something I would far prefer to do today is to reread Bridget Jones's Diary. Now I think BJD has been unfairly maligned as of late, and I blame it on all the inferior poseurs who jumped gleefully on the chick-lit bandwagon following the success of Bridget Jones. We are of course, all sick to death of this genre by now, and understandably so, but to read the original without having the weight of all the johnny-come-latelies dragging it down, is a joyous and refreshing experience. Bridget Jones is such a hilarious and sassy and confused mess of a modern single woman, that I want to go hang out in a pub with her. Actually, where I really want to go with Bridget is to Una and Geoffery Alconbury's New Year's Turkey Curry Buffet. I am fascinated with that concept. Where do Una and Geoffery get the turkey from to have a turkey curry buffet on New Year's? Is it leftover from Christmas? Would you eat week-old turkey, disguised by curry? Unless you like stomach cramps accompanied by diarrhea and vomiting, I should think that I would pass on that. And if the turkey is freshly cooked for the event, why wouldn't you serve it as a roast turkey? Who curries anything but leftover turkey? And besides, what did they have at Christmas then? Surely not turkey. I've had this discussion with Eva, who has suggested they had ham for Christmas, but that's just wrong in my opinion. Although I understand that the British do often have a big roast beef at Christmas. If you can shed any light on this mystery, I would be grateful, and hopefully the truth will not diminish the charm of Bridget Jones's Diary for me. Alas, though, I will have to leave the rereading of this for another day, as I am still trying to finish Brendan Behan's Borstal Boy. Eva wants to have a book club discussion with me when I am done, so I should try to finish during the Christmas holidays. But I have said too much already. The first rule of Book Club .... you don't talk about Book Club. I love the phrase "Turkey Curry Buffet" and since reading BJD I too have been fascinated with the whole concept, and have had the same discussion you just outlined. I'm with Eva, they must have had ham for Christmas, it just makes practical sense. Yet. if I REALLY think about it - now this may have to do with the fact that I'm not really a fan of curry (in copious amounts) - the turkey may have been left over, as why would you put curry over regular turkey? Its fine just the way it is. Plus, there is the whole digestive process you mention. Gawd, I hope those people are not cooking on a gas stove. Ahhh, the circle arguement continues! You know another phrase I love from that book? "Fancy-dress party." Makes me giggle. No real reason. I'm going to a fancy-dress party for New Years. No chance of a turkey-curry dinner, otherwise I would have enquired. Allison, thank god I'm not the only one! I always knew there was a reason I liked you! That turkey curry thing has had me flumoxed for years. There is no definitive answer is there, only speculation. Only Una and Geoffery know the true story, I'm afraid. You truly are going to a fany-dress party for New Year's? As opposed to a frumpy dress party? Ooo la la! But you would tell me if you were ever to attend a New Year's Turkey Curry Buffet, woudn't you? Really, you didn't want to go to the mall? Thought it would be fun today ... well, not really. But that would be a good movie - just two hours straight (real time) of people returning their Christmas gifts. Post-Christmas is such an overwhelming time for reading ... as I already have books I want to read, plus I want to read all the ones I've gotten - all at once. I sweated, elbowed, cringed, swore and cried enough in them BEFORE Christmas....I can't understand why on earth anyone would willingly subject themselves to more torture AFTER Christmas? I'm so totally with you on this one Barbara. I'd rather have hot tar poured on my eyeballs while listening to rap music on blown speakers. Glad your Christmas was a huge success. All the best to you and your family. Well, I classify any outing where I'm required to wear a dress a fancy-dress party. Now that I remember it, in the book its used to describe a costume party. So, I lied. My memory has failed me again. Ooh, I love Will's idea of shooting (in real time) the xmas gift return. That would be an experiment. Will, that's a brilliant idea for a movie! It has guaranteed drama and conflict, and the possibility of witnessing extremes of human emotion and behaviour. I'd pay to see that. There is never enough time to read those books, is there, and one always gets more for Christmas. At least with music you can do other things at the same time. "I'd rather have hot tar poured on my eyeballs while listening to rap music on blown speakers" - oh Deb, I can tell you love shopping as much as I do! I too could never fathom why someone would subject themselves to that torture just to save a couple of bucks. The world is full of masochists. Best to you and your family for the holidays as well, my dear. I love Will's idea for a Christmas gift return film, as well. Simple but effective. I absolutely love fancy dresses. Whenever I visit New York I'm in seventh heaven just wandering the fancy dress shops even though I no longer have occasion to wear them. That was one of the best things about being a classical pianist. I always got to wear fancy schmancy dresses! Too bad I sucked at the whole performing in front of people thing! p.s. I feel as though that has to be the dopiest comment I have ever written. I think my brain has become addled by too much partaking of Christmas goodies and spirits of an alcoholic nature! I don't think there was one dopey thing about your comment, Toccata. I rather admire people who can wear fancy dresses, as I always feel like a pig in a poke when I get all gussied up. And I cannot imagine performing in front of a group of people, even if I had any talent to do so in the first place. I know little to nothing of this BJD and I plan on keeping it that way. Hey Barb!! Im being bad and using the Net at work heeheee! I love Bridget Jones. Sean and I make turkey curry every year, but not for NY's eve. We make it a couple days after Xmas. I think maybe they froze the turkey leftovers for a week until NYs. I went boxing day shopping and spent ALL my xmas money! I felt thoroughly beaten up too at the end of the day!!! Bridget Jones's Diary is a very girly book, Cool Cat. You are far to manly to be reading that. How very cool that you guys do turkey currry! I thought that only the Alconbury's did that. You know, I'll bet they did freeze the turkey. But then they would have missed out on days of leftovers, and that is sad. I cannot believe you went shopping on Boxing Day. I am so gobsmacked that I have no snappy comeback. I'd re-read anything rather than go to the mall. I'm not going anywhere NEAR a mall until next week at the earliest! so a quick I am not in a hurry to shop anytime soon will be my quick comment. I'd sooner reread a cereal box than go to a mall, anytime of the year, Maureen. Besides I had my fill of shopping before Christmas. I got your card !!! Thank you so much. Very, very kind of you. I'm blogging for a day or so, then I'll be off to Scotland for the new year. I've been reading your posts and it looks like you had a great christmas. Ben, Scotland for New Year's? Is that as romantic as it sounds? I can just picture everybody Hogmenaying and such, and I want to join in. How about a film of people returning inferior chick lit dreck after having been spoiled by Bridget Jones' Diary? To break the monotony, you could interview people on the turkey curry dilemma although I think Mel solved the problem with her freezer idea. I suspect you were a film-maker in a previous life, Dale! You could tie this in to a cooking show, perhaps, where people actually attempt to host a turkey curry buffet. I'll meet you at Oona and Geoffrey's tomorrow, m'kay? I think BJD stands up - it was clever then and is clever now. You are right, PF. BJD does stand the test of time. Even the film was fun (although the film is never as good as the book of course) and Renee Z was quite adorable.